Photograph of the preparations for the start of the Grand Central Railway operated rail service from Sunderland to London Kings Cross. 8th November 2007 was a historic day for Grand Central Railway. 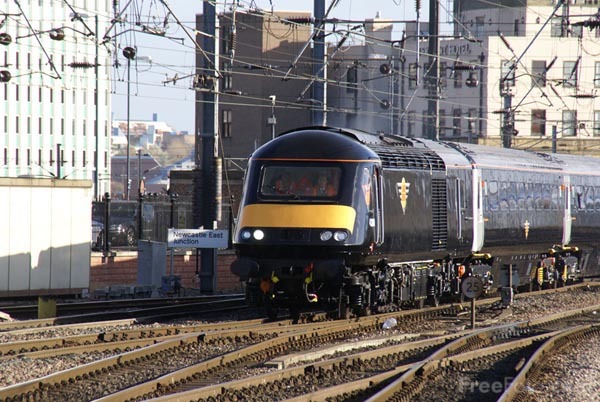 Their newly refurbished HST went out onto the main line for the very first time. Power cars 43080 & 43067 hauled a set of 5 mk3 carriages. It operated a short trip from Heaton Depot to Newcastle Central Station via both the bridges. Latter in the day it made a return trip to York. All our pictures of the very first trip are taken at Newcastle Central Station. They plan to operate three passenger services per day in each direction between London and Sunderland.